Maarten Ten Holter of Vripack contacts me to say that he's been appointed joint central agent - with Dennis Frederiksen of Fraser Yachts - for the sale of RMK's 36.58m superyacht Private Lives. Delivered in 2003, she's a proven 'go anywhere' expedition yacht, with several successful transatlantic crossings in her log books. A very popular charter yacht, she sleeps 10 guests in a master, two doubles and two twins and is Lloyds classed and MCA compliant. 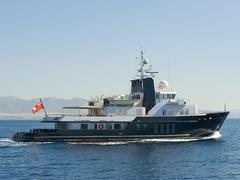 Private Lives will be available to view at the Monaco Yacht Show and is asking €9.65 million.